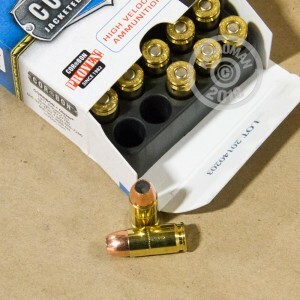 This 9mm Luger +P ammunition comes in a cost-effective case of 500 suitable for both training and self-defense. 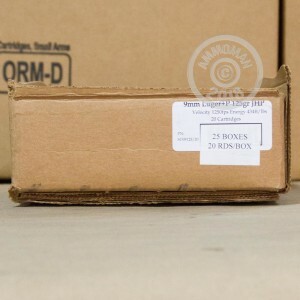 With this much ammunition available, you can thoroughly test this load in your firearm, train with it to get used to the recoil level, and carry it with confidence. Each round in this case fires a 125 grain jacketed hollow point bullet at a muzzle velocity of 1,250 feet per second. The combination of a medium weight bullet fired at a high velocity produces about 9-15 inches of penetration and strong expansion for quick incapacitation of an assailant. The main drawback to this setup is higher recoil, although users of full-size pistols like the SIG P226, Browning Hi Power, Glock 17, or 9mm versions of the 1911 will find this less of an issue. 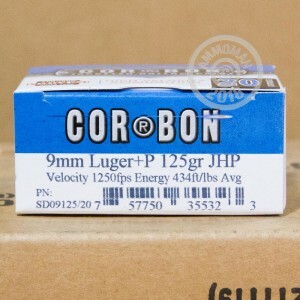 More than most other brands, Corbon ammo is known for "hot" high pressure loads, which make up a significant portion of its product line. This focus means that Corbon has a great deal of experience in producing safe but effective +P ammunition. Their products are loaded in Sturgis, South Dakota using non-corrosive Boxer primers and brass cases.